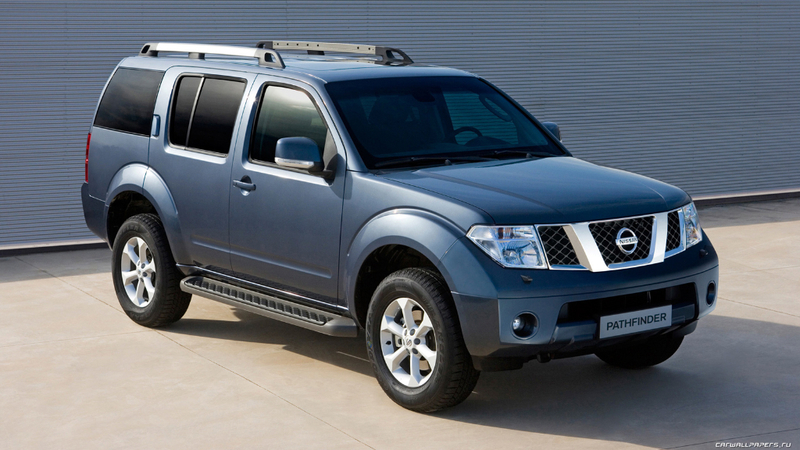 Since its Australian inception during the 1980s, the Nissan Pathfinder has undergone several redesigns of its body. It has moved from truck-based to car-based platforms and in turn become more spacious, comfortable and fuel-efficient. The latest models are aimed more at the urban market and can’t take you as far off the beaten path or tow as much as earlier versions. If you’re looking for a powerful family car with three rows of seating and attractive interior finishes, the Pathfinder ticks the boxes. Buying a new car doesn’t necessarily mean you’ll have to splurge. Second hand Pathfinders have generally held up well. Rust can get into the lower corners of the door and the tailgate however it is uncommon, unless the vehicle has been driven along beaches. If you’re selling your Pathfinder, expect a price from $3000 to $5000 for a 1995 Nissan Pathfinder Ti petrol; $9000 to $14,000 for a 2003 Ti petrol; $15,000 to $22,000 for a 2005 ST-L petrol; $26,000 to $35,000 for a 2009 ST diesel; $38,000 to $50,000 for a 2010 Ti diesel. Let’s take a look at some of the details on a newer range of the Pathfinder so you can get an idea of how the car you’re selling may measure up. The 2017 Pathfinder comes as a three-tier range with different costs and features that make a difference to certain buyers and will likely change what an asking price can be for a used vehicle. If you’re simply shopping around for your next car after you sell your old Nissan, you might be interested in some of the nuances of this underrated model. Let’s take a look! The entry level Pathfinder ST is the least expensive in the range but has a $500 increase on its predecessor, likely due to its cosmetic makeover and some extra features we’ll get into soon. The ST is available in three options of its own with varying price points. The front-wheel-drive is the true base level option and starts you off at $41,990. Upgrading to the four-wheel-drive version will increase the cost to $45,490. There is also an in between option for a two-wheel-drive hybrid at $44,490. The mid-range ST-L also has three options. We’ll get into more detail later but for now let’s look at the cost of new vehicles. Keeping it consistent, you’ll have another three options when you get to the top of the range Ti. The hybrid version tops out everything at $69,190. Let’s remember that all prices listed above are for new vehicles and don’t represent the buying and selling costs once these babies have driven off the lot. The spread however does show you how the various models stack up so you can work out where you might fit in depending on your trim level. The 2017 range represents somewhat of a make-over year for the Nissan Pathfinder as the company found that this model wasn’t receiving the attention it deserved. The upside to this is that there are some extra features now as a standard rather than an extra. Let’s have a closer look. The entire range had a bit of a remodel so it looks a touch more modern with it’s redesign face as well as its new grille, LEDs, and turn signals. You’ve also got a choice now between seven different body colours! The main lacking point we can see across the range so far is the absence of Apple CarPlay or Android Auto capabilities so keep that in mind if these things are essential for you. All models also have a bluetooth-connected sound system with an 8 inch touchscreen, cruise control, three-way climate control and 18-inch alloy wheels. Those with children might enjoy the privacy glass windows for the back two rows. There is leather detailed on the wheel for the entry-level ST but upholstery is still cloth. If you opt for the mid-range ST-L you will naturally enjoy a few extras not included above. Perhaps the most noticeable add-ons are the panoramic sunroof and the leather seating but you’ll soon discover the beautiful Bose 13-speaker sound system, the handy satellite navigation, and even fog lights and heated mirrors. Naturally, the top-tier Ti has just a little bit more on offer. Driver’s will love the memory settings on the electric seats while kids in the back can enjoy entertainment on the seatback screens. Wheels are now 20-inch alloys, side mirrors auto tilt on reverse, and auto-levelling headlights are now fitted with LEDs. For those really in it for the space aspect for carrying loads of friends and family, it’s nice to know that passengers riding behind you will enjoy aux jacks, usb charging points, personal AC control and ample storage space. Check out the next section to see how roomy it really is back there. This car is not make to be small, it’s made to fit lots of people and cargo inside. If that’s what you’re after then there are no problems here! If you’re looking for something compact that will fit in obscure parking spots, this is probably the wrong choice. The only real downside to the size of this mammoth is the 11.8 metre turning radius. Just make sure you know how to back out of tight spaces. Boot space can be adapted by folding either the third row or both rear rows flat. Doing so will increase storage space from 453 to 1354 to 2260 litres respectively. The initial storage is perhaps smaller than expected for a vehicle of this size but it seems that passengers may be emphasised over cargo in this case. That said, the two row fold down option may be very handy if you’re camping or moving furniture and only need space for two passengers tor ride. The cabin also features cupholders throughout plus bottle holders within the doors. The ingenious sliding second row seats means they can actually be adjusted to accommodate for passengers in the third row, which itself reclines! Climbing into the very back has been made incredibly easy thanks to the new “EZ flex” seat design which folds the second row seat back and base almost completely away creating a much easier gap to climb through. Now this wouldn’t be a family vehicle without a good safety package would it? For starters, all models in the range earn the 5-star ANCAP rating which is really to be expected these days. With a few varying aspects between models, there are some standard safety features that you can rely on even with the entry-level ST. You’ll have Cruise control, six airbag system, parking sensors and reverse cameras, and ISOFIX anchor points for child seats. The Top two models also have AEB, rear-cross traffic alert and forward collision warning as well as active cruise control. Within the three tiers there are only two engine options, the V6 petrol and the hybrid. The V6 is a 3.5 Litre with a CVT auto transmission that makes 202kW and 340 Nm. The electric motor-fitted hybrid engine is a 2.5 L four-cylinder with an electric motor at 15 kW. Together it makes 188kW and 330 Nm. It also has a CVT auto transmission. With all this talk about size and space, it won’t be too surprising that the Pathfinder isn’t necessarily the most fuel efficient option out there. Consumption seems to vary from just under to just over 10L per 100km depending on whether you opt for two or four-wheel-drive. If you go for the hybrid you might take that down to about 8.6L/100km. Emissions are reported between 230 and 234g/km for the petrol engines while the hybrid lowers the damage to about 200g/Km. Warranty is pretty standard at 100,000 km or 3 years. If you’re buying a Nissan Pathfinder that is still within warranty then you’ll need to make sure to have annual servicing or at every 10,000 kms. Hybrids needs servicing twice a year or at 7,000 kms. Pros: Lot’s of space, handles well, improved features. If you’re looking at selling a car or you require cash for cars make an enquiry with us today!